After about two or three weeks or living the Keto lifestyle, you might start looking for something sweet again. I am guessing you are happy with losing those carb cravings, but you remember when you used to have a little dessert at the end of your meal. There are a ton of Keto Chia Pudding recipes out there. But I put my own spin on it, and here it is. My husband always teases me.... "you have to create your own recipe.... you cannot just follow someone else's recipe." It is not that I cannot follow, but a lot of times I have my own thoughts about changes that need to be made. So if you see areas to change my recipe, change away -- I get it. The great news is this dessert is low in carbs and high in fiber and protein. Chia seeds are good for your belly health; they aid in digestion. They are also high in nutrients for example magnesium, calcium, phosphorus, and antioxidants. And maybe the best of all, they are a source of omega 3 fatty acids. So this dessert is packed with goodness, and it satisfies your sweet tooth. Enjoy! Mix ingredients well. Use an emulsifier blended or a high speed blender if you want the pudding to be smooth. Place in the refrigerator for 2-3 hours or overnight. My daughter is going to kindergarten. No not this year, next year, but still it is fast approaching. In order to understand where I am going with this story, I have to take you back to the beginning. My first day of my senior year of high school. I got off the bus, walked down the street to my home, put my hand on the front door handle, and the door swung open so fast that it nearly pulled my arm out of its socket. My mom was on the other side of the door opening it quite fast. She had tears running down her face, and my dad was standing behind her at the top of the steps. He said,"She is all yours. You need to take care of her. She is upset about you going to college next year." And with that, he walked away placing my teary eyed mom in my hands. I hugged her, and she proceeded on telling me how all day she had been upset about me going to college next year. She explained to me how fast this LAST year was going to go. And the truth is she was right. It did go fast. And now I am a mom, and my kids are six and four. I see how very fast time goes. It seems cliche to talk about this, but it is cliche because it is true. It doesn't seem that long ago that they were born. My son started kindergarten this year, and I miss him. He even joined his first club, lego club, and he loves it. But this means that he goes to school on Thursdays from 8:30 am until 4:45 pm. It is a long day. My daughter starts kindergarten next year. I have been teasing her lately and saying that I am not going to send her to school next year. I tell her that she is way too much fun to hang out with, so school is out for her. Well, of course she laughs and tells me," No, Mommy I have to go to school, just like Aidan. I have to learn and grow up." So wise my little girl. Anyway, so this is where the story begins to take a twist. We were grocery shopping Monday, I decided to pull out my typical tease line,"So, I have decided that I am definitely not sending you to school next year. I mean you don't want to go to school and learn? And I love hanging out with you. If you go to school, who am I going to hang out with?" Without skipping a beat, she looked me straight in the eyes and started to say, "Daddy....." But she stopped herself, looked away for a moment, and said under her breath, "oh no Daddy is at work." Then she raised her head and her eyes and confidently looked at me and said," Mommy, you need to get an imaginary friend." I laughed so hard. And I thought, that is what I am going to miss. What a gift it has been hanging out with these two little people. No matter how frustrating situations may get sometimes; it has been a gift. My daughter didn't think she was being funny. She thought it was a great solution for me. At dinner time, we always recap our day and share it with each other. One of the moments my daughter chose to recap was a moment that she believed highlighted not only her problem solving skills, but also her ability to help someone else in need with a problem (me). When she arrived at her solution, "Mommy needs an imaginary friend," everyone at the table had an opinion on who this imaginary friend should be. My son immediately wanted the imaginary friend to be a ten year old boy. He thought this would be the most fun for me, and he wouldn't mind playing along with us once he got home from school. My daughter thought it should be someone just like herself -- of course. And my husband just thought it needed to be an adult woman, so we would have things in common to talk about. I sat quietly listening to them debate the issue with passion and simply thought .... what a Blessed life I have. And I don't want to miss a moment thinking about stopping our future that is constantly revealing itself to me. I love the idea of making jam and canning it myself. I know exactly what went into making it. And there is a sense of pride that I feel when placing the homemade jam on the table. Also I love love that my kids have no idea what store bought jam or jelly tastes like. It does takes some work, but a lot of things worth doing take your time and energy. So if you are feeling that desire to try canning --- peach jam is a great place to start. No experience needed. There actually is not much you have to invest in even if you have never canned before -- well, except your time. But you do need to buy a few things. And lastly, I am sure you have a large deep pot. It has to be deep enough that once the jars are in the pot you have 1 to 2 inches of water over the jars. Ok -- Once you have the supplies and a large chunk of time. It is time to get started. My mom and I did this together. It was great having a partner to hang out with because it does take a while to go through this process. Step 1: Taking the skin off the peaches -- blanching. This is the labor intensive part -- once this is done, the rest is just time -- it is easy. I used 24 peaches; I was able to make 12 jam (half pint) jars from that quantity of peaches. So adjust the recipe to your needs. The first step in getting the thin skin off the peaches is getting a large pot of water to a fast rolling boil. 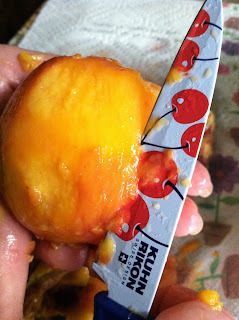 Next, with your pairing knife, place an X at the bottom side (the opposite side of the stem) of each peach. Also get a large bowl and make an ice water bath for the peaches after they get out of the boiling water. The ice water bath will stop the cooking process; you don't want to cook the peaches -- just get the skin off. Once the water is boiling, it is time to start blanching. Work in small batches of peaches to make it easier for yourself. With a slotted spoon, take 6 or so peaches and place them in the boiling water for 40 to 60 seconds. After 40-60 seconds, take the peaches out of the boiling water and place them straight into the ice water bath. After they have cooled off, using a paring knife the skin should come right off. Continue in batches until you have blanched and cooled all your peaches. This recipe makes 12 jam jars of yumminess. Take your 24 blanched and skinned peaches and cut them into large chunks, remember to take the pits out. In a large heavy bottom pot (I say this because it has to cook for a long time, and you don't want your jam to burn onto the bottom of your pot) place your peaches. Add the sugar, lemon, juice, and water. Start cooking. Try to keep it at a simmering boil. Make sure to stir occasionally so you don't burn the jam onto the bottom of your pot. The cooking will help thicken your jam. After the peaches have been cooking for about 1 hour, I use a stick blender to puree to the consistency I like, which is somewhat chunky. I like chunky jam. I like to see and feel chunks of peaches, but if you like it smoother keep blending until it is as smooth as you like it. Continue cooking until you reach the consistency you like. To check the consistency, you have to take a small amount of jam, place it on a plate, and put the plate in the refrigerator. You cannot see the end consistency until it is cooled. Which is why I started checking the consistency after about 2 hours. Remember it will always be looser than jam made with pectin. It is more of the consistency of a French jam. Once you have settled on the taste and consistency, it will be time to start the canning. Get that large pot we talked about before filled with water -- but not too much water that once you place the jars inside the pot it will over flow onto your stove -- you would be mad at me if this happened, and I didn't mention it. Get that water to a rolling boil. Set up an assembly line for yourself. Put jar and lids into the boiling bath for a minute or so. Once jars are sterilized, you can place boiling jam into them. Remembering to keep the sides of the jar clean from jam (you don't want jam on the side of the jar because you want the jars to be sealed perfectly). Leave a little room at the top -- don't fill jam to the top rim of jars. Next, use the air bubble stick and slide in down the inside of the filled jar; this helps the air bubbles to escape. Then use magnet stick to remove lids from boiling water and place them on top of jars. Place lids on tightly (you will need to use oven mitts). The last step in canning is to process / boil the filled jars. You will have to do this in batches as I am sure you don't have a pot big enough to place 12 jars in it. My guess is you will be able to fit about 4 jars at a time at the bottom of your big pot. Process / Boil your filled jars for about 10 minutes. Remove them from the boiling water bath with your tongs and set the jars aside on a towel for 12 hours. I have heard that putting the hot jars on a cold counter could cause the jars to crack. I am not sure if this is an old wives tale, but I did it anyway because the jam takes too long to make to have a silly mistake like that get in the way of my morning coffee, toast, and fresh homemade peach jam. As the jars start to cool, you will hear each of the jars "ping" or "pop." This is the sound of the jars sealing -- pulling that lid down tight and creating the tight seal you want. After the jars are cooled, you have to test each of the jars to see if they are sealed. The test is easy -- touch the top of the jar. If the lid pops up and down with the pressure of your finger, it is NOT sealed. So you have to reprocess (boil) that jar again. Or fix the situation like I chose to do ---- this is the first one we are going to eat tomorrow morning. Once you open a jar and start using it, keep it in the refrigerator. It can last about two weeks or so. You are finished. The morning following the canning day, I always sit down and enjoy a perfectly boiled egg, a hunk of cheese, and toast with my fresh peach jam. Mmmm a French breakfast... Yum! Darth Vader Cake and "AMAZING ILENE Buttercream FROSTING"
My baby boy turned 5 years old. He is into Star Wars, the original Star Wars with Luke, Han Solo, Princess Leah, and Chewy. And he just loves Darth Vader. Because when you are little and innocent, you only see and understand what you know to be true. So he says that Darth Vader is a good daddy. Because he only knows a world where daddies are good. So he focuses on that last scene when Vader stops the Emperor from electric shocking Luke, his son. Hence..... Darth Vader is a good daddy. When he first decided on a Darth Vader cake for his 5th birthday party, I showed him pictures of flat Darth Vader cakes. Aidan immediately said, "oh, no Mommy I want the head to be a real sized head sitting on the table." To which I responded, "you mean 3D?" Aidan said," no not 3D.... I want Darth Vader... with his black helmet." I said,"That is 3D .... that mean a 3 dimensional head." And I showed him with my hands what I meant. Aidan was excited and his head started shaking up and down, "yes, that is what I mean a 3D Darth Vader." He was satisfied that I understood my challenge, and he walked away telling me he couldn't wait to see his cake. It felt a bit like a mob boss scene from a movie. He set up the difficult challenge, and he walked away with confidence that the task he requested would meet the requirements he set forth. I was a bit sick to my stomach. I was pretty sure this was going to be the first birthday cake I was not going to be able to make. I did a bit of research on the internet. All the 3D Vader heads I found were covered in black fondant, because it gives the cake that smooth perfect finished look. The only problem is my family loves the frosting I make. This frosting is amazing; it is not my recipe it is my dear friend Ilene's (Lene's) recipe. She has used this recipe for year for all of her kid's birthday cakes. As only Ilene would say, " this recipe is ancient." Trust me that is exactly what she would say. And I feel so fortunate that she shared this perfect recipe with me. So thank you Lene. Once you make this frosting, it would be totally appropriate for you to say "thank you Ilene" aloud in your kitchen. And when I say amazing.... that is only because I cannot think of another more spectacular word to use. Cream shortening and butter until smooth. Add sugar and cream again. Add milk slowly and extract - beat on high for 5 minutes. Frost or store in airtight container in the refrigerator. Whip again before using. I use this frosting to frost well, anything that needs frosting. I dye it to suit my needs. And for this cake I needed a little to be dark grey and a lot to be black. My mom found some dark black Wilton gel icing color. It was perfect. It didn't turn that typical grey color. The frosting turned a beautiful strong black color. Now back to my cake problem. It seemed to me that I had two main problems. First issue was making the actual cake --- carving and putting together a head. The second problem was this fondant issue. I don't know how to use it, and even if I did -- I want to use the AMAZING ILENE frosting. In in the end, I knew if I failed I would have to submit to the local bakery and admit my son had pushed and found the end of my cake design talents. But until I reached the end and realized I was defeated by Darth Vader, I was going to try to make this cake for my boy. I mean if Aidan believed I could make this cake, why couldn't I have that kind of confidence in myself. As far as the cake is concerned, I made a lot of cake for this one. I made three 9 inch rounds, one 7 inch round, one bowl (for the top of the head), and one small ramekin (to cut in half for the eyes). Once all the cakes were made and cooled. I put all the cakes in the freezer for an hour. I needed them to be harder before I started cutting into them. I put two of the 9 inch rounds on the bottom. Then I put the 7 inch round on top of those two cakes, and I finished the top of the cake with the bowl. I used the last of the 9 inch rounds for spare parts. I cut a small rectangle from the 9 inch round to make Vader's breathing apparatus / mouth piece on his helmet. Then I cut about a 1/4 of an inch out of the depth of the rectangle to make the the two triangles on the sides of that breathing apparatus. I tried to stick to shapes I know in order to create the helmet -- rectangles, triangles, and semicircles. I cut the little ramekin in half and used those semicircles to make Vader's eyes. I cut two curved pieces out of the remaining cake and attached it to the side of Vader's helmet (like where ears would be). This was supposed to be the curve or flared out part of Vader's helmet. Let me tell you, it looked rough before I put the crumb coat (think layer of frosting) all over the cake. Lastly, I put a crumb coat (thin coat of frosting) all over the cake. This is what it looked like with just a crumb coat of frosting. A bit rough looking, but I had faith that once the black frosting was on and all the details were in place it would look like Darth Vader. Once the crumb coat was on, I put it in the refrigerator for an hour. Now it was time to put the black frosting on. I had to triple the above recipe. For past cakes, I have only had to double the recipe, but Darth required a lot of frosting. Once I frosted the cake, it was time to add some details. My mom went out an bought me black fondant, which worked perfectly. I was skeptical about using it since I never had used it before. I figured I wouldn't be able to use it since I had no experience. I was wrong, it was easy to work with -- well, for the small quantity I used, it was easy. I used it to put details -- lines of definition on the mask, and for that purpose it was perfect and easy for a beginner. I highly recommend trying it for details on your cakes. I am so glad my mom bought the fondant because I wouldn't have, and in the end the details made the cake look so much better. Thanks mom. When my little boy saw the cake, he covered his happy smile with his perfect little hands, screamed in delight, and immediately said,"it is perfect, thank you Mommy." Even when you think your child's expectations of you are too high, start reaching even higher. Happy Birthday Aidan, you are a Blessing. These are my go to cookie for birthday parties, special occasion-guest-take-home-gift, anytime sugar cookie recipe. They are easy, you can make them into any shape or cut out cookies you want, you can make them ahead of time (they keep beautifully), and oooooh I almost forgot the best part --- they are super yummy and soft. I have made these cookies into dinosaures, trains, butterflies, flowers, crosses, firetrucks, and monkeys --- just to name a few. In a large bowl cream butter and sugar. Beat in eggs and vanilla. In a separate bowl, combine flour baking powder, and salt. Add the flour mixture to the wet mixture in three different batches. Do not over beat. Place the dough on a large piece of plastic wrap, cover and wrap tightly for at least an hour or even for overnight. Take the dough out and cut off a chunk that is manageable for you to work with. Once the dough gets too warm from your hands, it is becomes difficult to work with -- hence keep the dough pieces you cut manageable. Sprinkle your counter with some powdered sugar. I use powdered sugar instead of flour because the extra flour makes the dough tough. Roll out the dough to about 1/4 inch in thickness and then use the cookie cutter of your choice. When you have extra dough, but there is not enough to cut into more cookies or it has become too warm from your hands, put it back into the refrigerator to get cold again. Place the cookies on an ungreased cookie sheet in a 400 degree oven for 6-8 minutes. The cookies stay pretty light in color. It may take a few times to figure out the exact time for your oven; 8 minutes is perfect for my oven. Remove them from the pan and let them cool. Decorate or leave plain they are wonderful any way you choose to eat them. If you keep the cookies in an airtight container, they save well. When I make these for party favors, I put one or two in a small clear baggie and tie a ribbon on the top. You can make these cookies 5-7 days before your party, the guests will never know -- the cookies are that good. I have decorated these cookies using M&Ms; I did this when I decorated butterfly, flower, and dinosaur cookies. Mix a bit of water and a bit of powdered sugar into a paste. Use this paste to "glue" M&Ms onto cookies. I have used Royal Icing to decorate these cookies too. I have also served them plain. No matter what you choice, you cannot lose with this cookie. I have also put together cookie baskets for those who I love so that they can give cookies out at their special occasion. 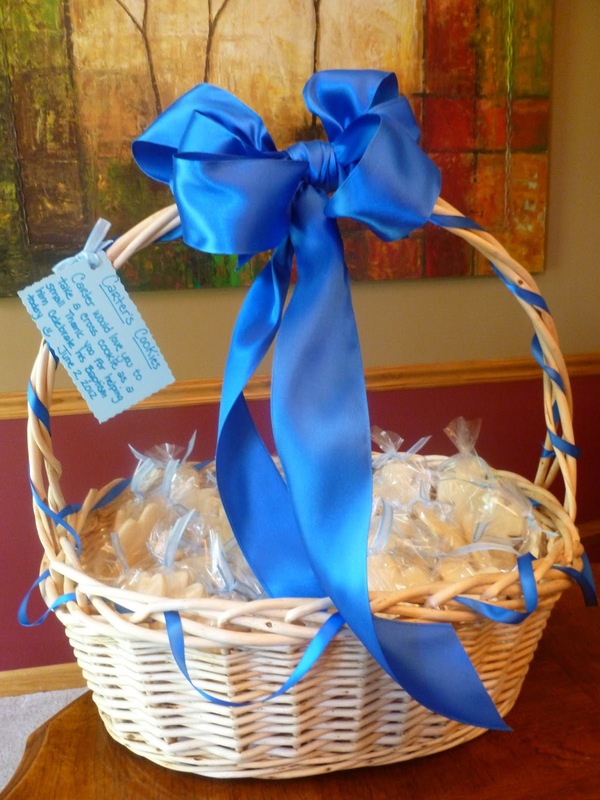 For example when my dear friend, Kristen, had a Baptism for her little boy Carter; I made a cookie basket for her to give out cookies to her guests as a thank you gift. I also made a similar basket for Nel, a friend of mine, who recently got married. So no matter how you choice to use this recipe. Know that it will be a winner. And people will ask you if you are serving your yummy sugar cookies.